which you can program to do the job for you. There is nothing better than seeing clean floors and if you can have them without all the effort being on your shoulders then it’s worth considering a robot vacuum. This vacuum will clean your floors and if it doesn’t have enough time to finish the area it will go and re-charge it’s batteries then come back and finish the job. 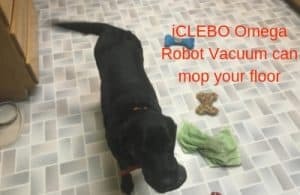 Whatever your flooring or whether you have a pet that sheds, this iCLEBO Omega can work for you. If you’re wondering how much this help will cost you, then check the links below for the current prices. is a smart looking robot vacuum, it’s black with a gold bumper and it does come in a white color with a silver bumper, although that might be more expensive. The shape of the vacuum is like a rounded D-shape which helps it to get into corners. The iClebo is 13.9 x 13.6 inches in size and it has a height of 3.4 inches which is just a bit smaller than the Roomba design. All the buttons to control the starting and stopping and the different cleaning modes are on the top of the unit, although it comes with a remote control too. The access to the dustbin is also from the top of the vacuum. The iCLEBO Omega Camera Mapping Yujin Robot Vacuum Cleaner can handle cleaning on all types of flooring. Its especially good for pet hair as it uses a rotary blade brush underneath which is a better type of brush for keeping hair from getting tangled around it. This vacuum also has a turbo mode which can be selected with the remote control but will also automatically kick in if the robot vacuum goes onto carpet from a hard floor. The turbo mode and suction can get a lot of dirt up off the floor. This iCLEBO robot vacuum does not use wi-fi or your phone for control but uses a remote control to allow it to be scheduled and to select the cleaning mode you might want to use. If you were hoping for a voice controlled vacuum this is not the one for you, but if you have problems with using wi-fi to control your appliances then you will love it. You can use the remote control to set the time and then you can set the timer to allow you to use your robot vacuum on a daily basis automatically. You can even use it to move the vacuum to an area you might want it to start cleaning or spot cleaning using the arrow buttons. uses a 5 stage cleaning system to keep the floors clean, it has a strong suction, a rotary blade brush underneath, 2 side spinning brushes to help get right into the corners of the room. It also uses a hepa filter to to stop particles of dust from going back into the room and last but not least it has a clip on mop which can be used to wet or dry wipe your hard floors as the vacuum picks up all of the dust and dirt. There is a camera sensor on top of the robot which takes a picture of the surrounding area mapping it out so that it can clean in the most efficient way. This means if the Omega runs out of power while cleaning it can return to the dock to re-charge and then go back to where it finished to resume until it finishes cleaning. It has 3 cleaning modes, automatic, max and spot clean. The automatic is the one that you will probably use the most which will use extra suction when it encounters a carpet. The max mode covers the area twice by working it’s way in a linear pattern till complete then it will turn at right angles and clean again covering the floor in 2 different directions for a deep clean. The spot mode works well with spills. There is also a mopping function on this vacuum where you can clip a wet mopping attachment which includes a cleaning pad onto the base of the unit. You can use this as a dry mop to wipe your hardwood floors behind the vacuum or wet the pad to wash the floor. Using the mopping function disables the vacuum from climbing over sills and carpets. This won’t give your floor as good a mop as you would but can keep them looking fresh. include drop sensors to stop it from falling down stairs, there are 19 obstacle detection sensors so it’s good at noticing and not banging into the furniture or other items you might have on the floor, even your pets. The camera sensors map the room to allow it to clean every part of it and to be able to know where it is at all times in case it needs to stop to re-charge. It has sensors that can detect carpets so it knows to automatically boost the suction or when the mop is attached it will turn away from the carpets. The sensors can also detect magnetic tape used as a virtual wall to stop the robot from crossing over it. This helps to protect any delicate items in your room or maybe protect your dogs water bowl. This robot vacuum is supplied with a docking station which you need to plug into an area where there is a little clear space around it so that the robot can easily move onto the charging points when it returns for a re-charge. It will run for around 80 minutes while cleaning depending on what type of flooring as carpet uses a bit more power to clean than hard floors. It can take up to 180 minutes to charge up fully. If it can’t clean your floors in one charge it will return to the dock to power up and then start cleaning again where it left off. includes a hepa filter, this can filter out particles including allergens so you might find that it improves the air quality from the amount of dust you would stir up if you were just vacuuming with a standard vacuum. You don’t have to do much maintenance with a robot vacuum. You will need to empty the dustbin, that is usually done after every time it has cleaned the floors and you can tap off any excess dust on the hepa filter to keep the suction going strong. I would check underneath the vacuum on a weekly basis to see if it is getting any hairs stuck around the wheels or the brush and if so you can clean them out and just wipe over the sensors with a cloth. What items you get in the box apart from the vacuum and the docking station are the 2 spinning side brushes which just push on underneath, the hepa filter, the mopping plate and 2 mopping pads. You also get the remote control with batteries, a cleaning brush and some magnetic tape for blocking off areas you don’t want your vacuum to get to. You can also buy accessory kits from Amazon if you need to buy extras. is in the mid price range and it’s worth checking not only Amazon but Walmart and Best Buy to see who is offering the best deal. It’s reasonably priced for what it offers as most robot cleaners offering room mapping are around the same price range. It’s definitely worth checking out. This Omega robot vacuum offers most of the features that you might need from a robot vacuum and from customer reviews seem to align with that. There are a lot of satisfied customers although there are a few negative comments on the mopping function and some customers feel it can get stuck in places. Overall it seems to do what it says and customers are satisfied and feel it is worth the money on all sites that sell it. offers you an alternative to some of the higher priced Roomba or Neato vacuums. If you can pick this up under $500, then I think it’s worth the investment. With the mopping function it will probably be more suitable to people with hardwood, laminate or tiled floors. Don’t rule it out though if you have carpeted floors because with it’s turbo suction it can handle them. You could buy another mapping robot for a similar price, the Neato Botvac D80 or there are other mopping robot vacuums like the Bobsweep although this doesn’t clean using mapping sensors. might fit the bill for you. If you’re looking for a robot mop that can scrub areas a bit more vigorously then you might prefer to think about something like the Braava 380T or Braava Jet 240 . Use the links below to check todays prices.